As a Swedish proverb says: The wait for something good can never be too long. The duffers are finally back with an episode that was not only recorded, but also published. We sincerely hope the shock is not too great. And if it is, we hope it is pleasant. Yannick is back to bring some sense to the proceedings, and he is joined by Dave, Paul and Mikael. The duffers shows true altruism by starting off with a mention of another podcast. The duffers delve into the art of numbering. Tech section with cable guy. Problems, users, problems, clients and problems. Deep thoughts about audiocasts and music. ccmixter.org is mentioned. We wonder who we are. After that, we do not talk about politics for quite a while. Time is a loop. Or a loop. Space is a final frontier. Or maybe just Babylon. Duffers watch television. Stuff to be seen include Blindspot, Once Upon a Time, Stan Lee’s Lucky Man. Yannick reveals he lives in a canton where most inhabitants speaks non-Cantonese. Face time with the duffers. The duffers discover Wikipedia, and educate themselves about Alexander Lukashenko, Alexander Litvinenko, a lethal umbrella, Wikipedia, duffer (! ), Footgolf and Bandy. Other sources available, e.g. here and here. The duffers discuss children’s literature not written by John Kerr Tiffany. Insights into culture was given, e.g. Flat Eric, Mr Oizo, Rubber. Suggested music. We resent any insinuation the Duffercast’s gone to the dogs. Music epilogue: an old song about a man, a woman and a guitar. 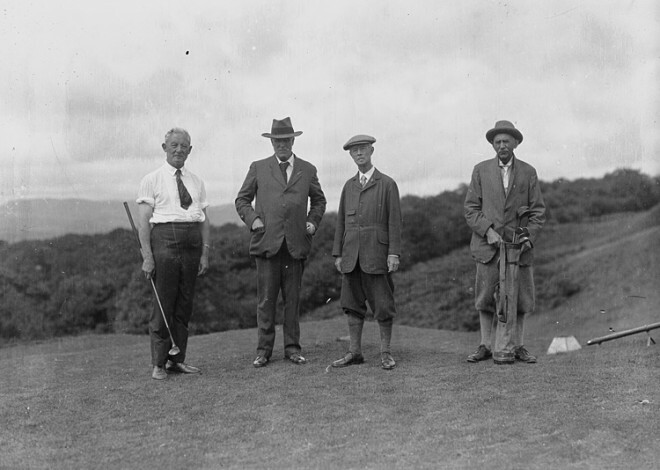 Episode art: Old photo of four golfers that might be duffers source (CC0). ← Duffercast 9 – The First Dufferette Ever!